Record music videos with yourself or friends. Easy to use, but the app may need more time to earn tokens than users initially thought. 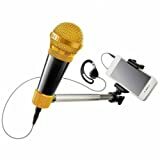 Record karaoke style music videos that are easy to share with friends and family. 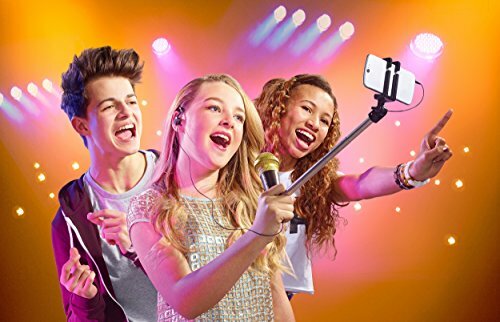 The Selfie Mic works with the free app, StarMaker, letting users record themselves singing along to the song of their choice, adding filters, auto-tuning, and assorted other visual and audio effects as they go. The app provides a huge number of songs for free, but there are some songs that cost tokens. These tokens can be bought, or earned by completing songs and scoring well during the song. We explain more about this in the Observations section, below. Most users are quite happy with this toy. The sound quality is good considering it’s a children’s toy meant to entertain teens with no expectation of professional grade capabilities. Lightweight materials are easy to hold, and the technology is super easy to figure out, with most kids getting everything to work before the parents have read the instructions. While the toy declares itself suitable for children 8 and up, the StarMaker app requires children be at least 13 due to the sharing feature for videos. The toy can be used without the app, though editing features will not be available to them. Because sharing videos with friends is a major part of this toy’s appeal, we will list this toy as meant for teens, not young children. A microphone attached to a selfie-stick is used to record karaoke style videos on a smartphone. An included earpiece connects to the microphone. Any headphones can be used with the mic if the included earpiece does not suffice. Videos can be edited and shared via text, email, and on social media. Parents can set restrictions to keep videos from being shared online. Videos can be made just by using the forward facing camera on the smartphone, but StarMaker will need to be downloaded and a free account registered in order to save, edit, and share videos within the app. Most kids have this toy up and running straight out of the box. It can be used to record videos directly to the phone, but videos with edited effects will need the StarMaker app. A free account must be registered to download extra songs, spend tokens, and save and share videos through the app. StarMaker works on a token system. Many, but not all of the songs are free, with some costing anywhere from 25 to 250 tokens a pop. Tokens are collected in several ways during the use of the app. 5 tokens are given for completing a song, and additional tokens are given when a song is performed well according to the app’s scoring system. Think RockBand in app form. The closer the user can match the words and pitch, the higher the score will be. This token system has been the one big point of contention for this toy. The toy is advertised as being free to use, and yes, technically this is true. However, children who want to download particular songs may need to earn more tokens before they are able to do so. We understand how this is frustrating, and wish the product was more up front about this process. Registering a free account with StarMaker gains the user with 300 tokens. Another 700 tokens can be gotten by redeeming the product coupon code, included in the toy’s packaging. Additional tokens can be purchased if these are not enough. “Hooks” can be accessed for free on most songs, but are usually only the chorus, or the most memorable part of the song. These hooks last around 30 – 45 seconds. Videos can be shared on YouTube and other social media, as well as sent via text and email. StarMaker also acts as a kind of karaoke community, and videos can be shared with other users, too. Accounts are all automatically started out as private, so any video sharing will requires the account be changed to public settings. The Selfie Mic website has more FAQ’s available, some of which were not covered here. Overall, this is a nice toy for teens who are into this kind of thing. Any headphones can be used with this, though there is an earpiece included. We encourage parents to be aware of children’s activities online, especially when sharing videos, pictures, or other personal information. 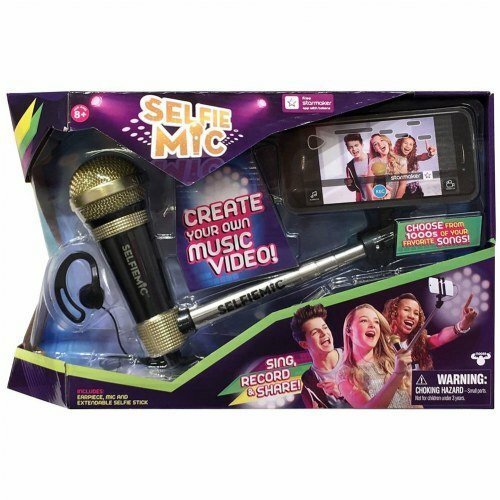 Sing like a star and create your own music videos with SelfieMic. Six of our favorite toys to take outside and celebrate Spring's arrival.